1. Preheat the oven to 200°C, gas mark 6. 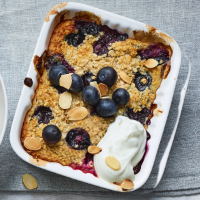 Combine 80g porridge oats, 15g desiccated coconut, 50g blueberries, 1 tsp baking powder and a pinch of salt in a mixing bowl. In a jug, whisk 1 egg, 200ml coconut drink (or whole milk), 1 tsp vanilla extract and 1 tbsp maple syrup, then stir into the dry ingredients until combined. 2. Divide the mixture between 2 small ovenproof dishes (about 250ml each in volume) and bake for 25-30 minutes, until light golden on top with a very slight wobble in the middle. 3. Cool for 5 minutes, then serve each bowl of porridge with 1 tbsp Coyo coconut milk yogurt alternative, a handful more blueberries and some toasted fl aked almonds scattered on top.